When it comes to planning and end of the year trip, school administrators have a lot of work to do – and that includes renting a school bus. That’s on top of deciding on a location that will be interesting and fun for the kids (and perhaps educational), getting all the necessary permission forms completed, and staying within a defined budget. With tight budgets, it’s important to select a school bus transportation company that offers competitive rates. Ideally, getting a quote is quick, simple and convenient so ideally, getting a quick quote can be done online. Safety is a top priority, of course, yet making sure you go with a company with a great reputation includes their on-time service record. Friendly drivers who are well versed on all the popular school trip destinations are also a must! Whether you want to check out Niagara Falls, spend the day at Canada’s Wonderland, or catch a Blue Jays game at the Rogers Centre – we’ll take you there. 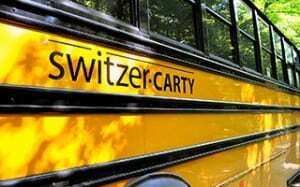 With Switzer-Carty, you’re choosing a school bus rental company that “checks all the boxes”. Our fleet covers Southern Ontario from Greater Toronto through Windsor, Ontario. Our drivers are highly experienced professionals. That means they are well trained to both drive the bus, and engage positively with children and teachers. Of course, they’re well prepared and know where we’re going! Our fleet of buses is second to none, ensuring reliable service and peace of mind for parents and school administrators alike. We’re flexible and can accommodate transportation services for any trip – even overnight trips. Our charter booking representatives can even recommend school bus trip destinations if you need some help coming up with an amazing idea! Spring is upon us so let’s get your next school trip booked for all your little travelers – easily!